The following photograph (copyright of museum, although not the ‘Caledonia’) was gratefully supplied to us by the Aberdeen Maritime Museum. 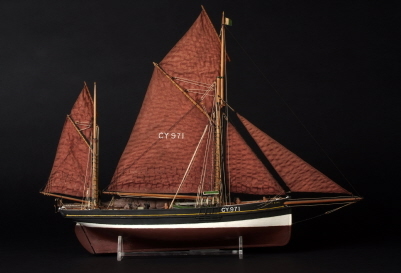 A smack was an English sailing vessel that was used to bring the fish to market for most of the 19th century and even in small numbers up to the Second World War. The smack was originally cutter rigged, until about 1865 when the smacks became so large that cutter main booms became unhandy. From then on cutters were lengthened and re-rigged and new ketch-rigged smacks were built, but the boats varied from port to port. Some boats had a topsail on the mizzen mast, while others might have a bowsprit carrying a jib. Large numbers of these boats could be seen operating in fleets out of places like Brixham, Grimsby and Lowestoft. The sails were usually red ochre in colour, which made them a picturesque sight in large numbers. Smacks were often rebuilt into steam ships in the 50s. Some of the old smacks have been re-rigged into ketches (or were never made into steam boats) and are now used as training boats for young sailors. “In March, 1808, the Caledonia, a stout vessel from Aberdeen, for London, hovered a day or two near the shore, and on the night of the 25th, being rather careless in their reckoning, the vessel touched upon these rocks. The whole crew were asleep, except the man upon the watch, who not apprehending danger, was unwilling to disturb them. There were twenty three persons on board. Danger increasing, he awakened the people; they fired one gun distress, which was not heard on shore, it being midnight. The people urged the Captain to fire again, who refused it. Their situation becoming desperate, he ordered them to fire, but, alas! The powder was wet. Their danger was extreme; the vessel was going to pieces. Sixteen took to the boat, and were all lost. Morning approached, and their dreadful situation was seen, the lifeboat heaved out, and the remaining seven with great difficulty were saved. The dead bodies of ten were found, brought and laid upon a bench at the Red Lion in Redcar; those of the other six were never found. Their friends were written to: two gentlemen came from Aberdeen, ordered their funerals and discharged the expenses. They now lie in Mark church–yard. Melancholy curiosity induced me to visit their tombs, They lie five in a row, a yard and a half asunder; and four feet below them lie the other five in the same order; two of them have head stones, Captain Booth, aged 50 died March 26, 1808; and – Burnett, Esq., aged 50, died March 26, 1808 and – Burnet, Esq., aged 18 years. This young gentleman was probably a relation of Bishop Burnet, as they were both of the same place. The names of the ten were John Mather, John Clay, Thomas Henry, John Burnet, William Heeley, William Pee, William Philips, John Runsey, John Booth, and Samuel Mackey. It will be noted that the Record kept by Mr. Coulson states that seventeen lives were lost, while Hutton says sixteen. In either case there was a deplorable loss of life. The names given by Hutton do not in some cases agree with those entered in the parish register book at Marske. The names according to the latter were as follows. March 30 – Capt. John Booth, of Aberdeen. March 30 – Capt. Wm. Heley, of the Caledonia, smack, of Aberdeen. March 30 – Joseph S -, Mate, of the Caledonia, smack, of Aberdeen. March 30 – James MacHie, Seaman, of the Caledonia, smack, of Aberdeen. March 30 – John Runsey, Seaman, of the Caledonia, smack, of Aberdeen. March 30 – William Philip, Seaman, of the Caledonia, smack, of Aberdeen. March 30 – Andrew Creig, Seaman, of the Caledonia, smack of Aberdeen. April 4 -Mr. John Mather, Passenger, aged 56. April 4 -Mr. Thomas Henry, Passenger, Aged 30. April 4 -Mr. John Burnett, Passenger, aged 18. It will be seen, too, from this that the surname of the master of the “Caledonia” was Heley, and not Hill as entered in Mr. Coulson’s Record. We are indebted to the Rev. F. Grant Hames, Vicar of Marske, for the extract from the register. Richmond also notes the wreck of the “Caledonia” but briefly in less than a couple of lines. He says, “Out of 29 passengers and seamen only 6 saved,” which is an incorrect statement. The “Book of the Lifeboat” (p.120) says that portions of the granite with which the “Caledonia” was laden were used in paving the footpaths in Moore Street, Redcar, and were only removed about 1890, and that odd pieces were, at the time the book was published, viz. 1894, still to be found as relics of the catastrophe. Many people in this area are not aware of what was a significant shipping disaster, immediately off our coast that amounted to a great loss of life. It can be further pointed out that since this vessels name came onto the ‘Shipwrecks’ section of Redcar.org, a living relative in Texas USA has been traced to one of the deceased crew. The Marske Parish Register states that 10 died. March 30 – Capt. John Booth, of Aberdeen March 30 – Capt. Wm. Heley, of the Caledonia, smack, of Aberdeen. March 30 – Joseph S -, Mate, of the Caledonia, smack, of Aberdeen. March 30 – James MacHie, Seaman, of the Caledonia, smack, of Aberdeen. March 30 – John Runsey, Seaman, of the Caledonia, smack, of Aberdeen. March 30 – William Philip, Seaman, of the Caledonia, smack, of Aberdeen. March 30 – Andrew Creig, Seaman, of the Caledonia, smack of Aberdeen. April 4 -Mr. John Mather, Passenger, aged 56. April 4 -Mr. Thomas Henry, Passenger, Aged 30. April 4 -Mr. John Burnett, Passenger, aged 18. Redcar.org would like to acknowledge below the help and assistance given by the below people. Aberdeen Journal Newspaper of 1808. Aberdeen Maritime Museum Aberdeen Art Gallery & Museums Collections Redcar Reference Library The Redcar, Coatham and Cleveland Literary Magazine J. Webb F.Brunskill. Footnote by Admin. Quite honestly, I do not think we will ever get into the position where we can state quite confidently we have covered all the events as to what happened to the Caledonia, and never will. Many thanks must go to John Webb for bringing to us the above facts, and his searching of records, both the above, and on our discussion board. I can assure you, that getting further into a subject via surfing the web sites, and archives, is no easy job.